Permanent sculpture implemented in a roundabout in the intersection Mikrofonvägen/Tellusborgsvägen at Telefonplan in 2009 on behalf of property owners in the area (Stockholm Stad, Vasakronan, Ramböll, JM, Stena Property, HSB, and SSM). 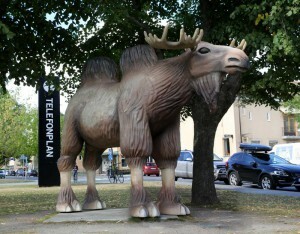 In 2015 the sculpture was donated to Vasakronan and relocated to the main square of Telefonplan. The sculpture is now temporarily removed as it is being poured into bronze. 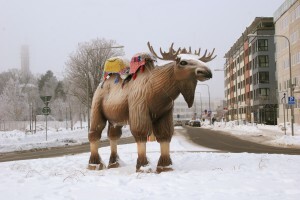 Hellman, Cyril, ”Camelmoose represents encounters between cultures”, interview in Situation Stockholm, 2009 nr. 6. Mårtens, Ann, “Power plugs “warms the Camoose”, interview in Kulturtidskriften Cora, 2009 nr 8. Eneberg, Malèn, ”Camelmoose was laminated in Nyköping”, article in Tidning Nyköping, 2009-05-12. 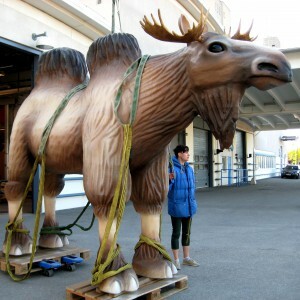 Hällsten, Martin, article in ”Camelmoose”, ETC, 2010 nr. Gunne, Nina, “Camelmoose adorns roundabout”, article in Arkitekten, 2009 nr. 6. Eriksson, Charlotta, ”Roundaboutmoose at Telefonplan”, article in Dagens Nyheter, 2009-05-14. The sculpture in production 2009. The sculpture at Telefonplan, people interacting with it 2009.